Connectivity has arrived in the vehicle - whether it is in-car internet or car-to-car communication. For the chassis too, the connected car is increasingly becoming a driver of innovation. 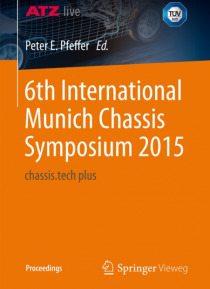 Predictive and intelligent chassis systems and automated driving are just some of the topics being addressed. In addition to enhancing driving comfort and safety, interconnecting the powertrain with the chassis … can also provide new functions, not only in cars but also in commercial vehicles. What is more, modularization, electrification of the powertrain, intelligent development methods and efforts to reduce fuel consumption are also driving innovations in chassis systems.